HOUSTON, Texas, November 4, 2011 (ENS) – BP Products North America must pay the State of Texas $50 million for emission of air pollutants related to a 2005 explosion and fire at BP’s Texas City refinery, Texas Attorney General Greg Abbott announced Thursday. The incident in March 2005 claimed 15 lives and injured more than 170 workers. In June 2009, the Attorney General’s Office charged BP with violating state environmental protection laws in relation to the incident. On Thursday, Abbott announced a proposed agreement that resolves those charges of unlawfully emitting pollutants during and after the March 2005 explosion. According to the Attorney General’s 2009 enforcement action, BP was responsible for 72 separate unlawful pollutant emissions that have been occurring every few months since March 2005. “The proposed agreement resolves the state’s enforcement actions against BP Products for unlawful pollutant emissions at its Texas City refinery,” said Abbott. The state’s 2009 legal action against BP stemmed from a referral from the Texas Commission on Environmental Quality, which regulates and permits emissions at Texas refineries. After the Attorney General’s Office filed its original legal action against BP, the TCEQ submitted a second, related referral against BP Products. 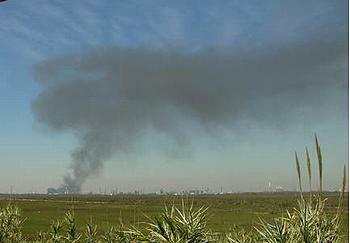 According to TCEQ investigators, multiple Texas Clean Air Act violations occurred at the Texas City refinery between April 6 and May 16, 2010. As a result, the Attorney General’s Office filed a second enforcement action and charged BP with illegally emitting approximately 500,000 pounds of harmful air pollutants in Texas City. Under the proposed agreement, the $50 million includes $500,000 in costs that the Attorney General’s Office incurred while pursuing the state’s enforcement actions. The remainder of the $50 million reflects civil penalties that will be deposited in the State treasury. A series of failures by BP personnel before and during the startup of the isomerization process unit in the Texas City refinery led to the explosion and fire.